To date 28,004 recipients have been assisted through the Micro and Small Business Grant (MSBG). This has impacted the lives of 140,020 small and micro entre­preneurs with the Fijian Govern­ment’s investment of $26.4 million. Minister for Industry, Trade, Tour­ism, Land and Mineral Resources Faiyaz Koya highlighted this dur­ing the disbursement of MSBG at Wairiki Primary School ground on Taveuni Island. Yesterday, 1312 small and mi­cro entrepreneurs received $1000 grants each. Mr Koya said this brought the to­tal businesses supported in Taveu­ni since 2015 to 2539. “Through this initiative, the Fi­jian Government has invested ap­proximately $2.5 million into the economy of Taveuni,” Mr Koya said. “From next week, we will be dis­bursing micro and small business grants in Savusavu, Nabouwalu and Seaqaqa. “To our Taveuni recipients, today you have proven that you have the ability and the know how to under­take business and positively con­tribute to the Fijian economy. “And with this assistance we are providing, your businesses will flourish and thrive. “We are putting our confidence and trust in you to use this assis­tance approximately. 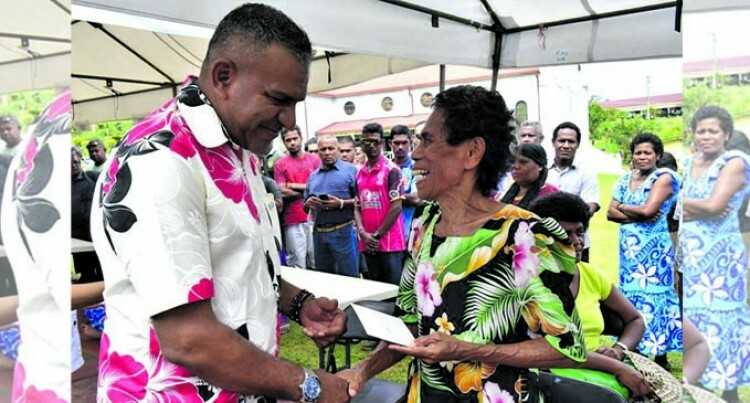 “Because all of you have been thoroughly and carefully assessed by the Ministry of Industry, Trade and Tourism and the Fiji Devel­opment Bank to ensure that only those who genuinely need this as­sistance are supported. “Be rest assured that your Govern­ment will support you in realising your ideas, through initiatives such as MSBG and the Young Entrepre­neurship Scheme among others. He said the number of applicants received this year was amazing be­cause it reached yet another high, compared to the last financial year.